The US Senate wonders about tax policy for the American Dream: How can income transfers be designed to benefit all children in need? The tax system is increasingly used to transfer cash benefits to families with children, but the United States accepts the trade-offs in program design very differently than other countries and gives children much less support. In response to my July 10th testimony to the Senate Committee on Finance hearing on “Helping Young People Achieve the American Dream” I received some homework, a series of questions asking me for a good deal more detail. You can review all of the questions on my November 11th post. Child poverty is central to discussions of social mobility, and it is natural to wonder how tax policy can be designed to support the incomes of the least advantaged. There are provisions in the tax code to help children from working families to get ahead. For instance, the Earned Income Tax Credit gives families an incentive to work so they can provide for their children and help them succeed. But not every family takes advantage of provisions like the EITC. How can we make sure that even children from the hardest circumstances have a chance to succeed? Is there a role here for tax policy? The one sentence answer to the question is simply: yes, definitely there is a role for tax policy to address this concern. Cash benefits to families with children are not necessarily universal programs, a simple payment to a family according to the number of children and regardless of income. Rather, they are targeted according to the number of children, and overall family resources. The example I am most familiar with is the Canadian program introduced in the 1990s, which was designed to be integrated with other income support programs provided by the provinces in order to both reduce disincentives to work, and to increase the level of income support to the least well-off families. A monthly payment is made to families with children: the more children in the household, the greater the payment; but the amount of the payment is lowered gradually the higher the families total income from all sources. Higher income families receive benefits, with the rate falling for successively higher income levels: lower for those with an income above the $24,183 threshold but below $41,544; then lower still if total family income was between $41,544 and approximately $109,894; finally nothing for those above this upper limit. In a study published in 2011, Lori Curtis, Shelley Phipps and I documented the fact that the proportion of Canadian children receiving government transfer payments is close to 90%, and about twice the proportion as in the United States. 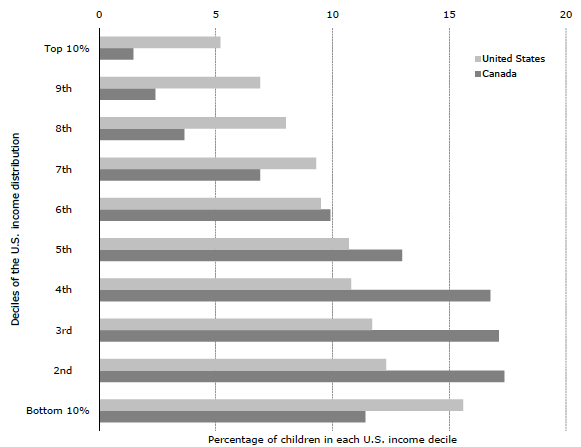 We also showed that if Canadian children lived in the United States they would be significantly less likely to fall into the bottom 10% of the American income distribution. The design of income transfers involves balancing a three-sided trade-off, and this balancing act is clearly being done differently in these two countries. First, there is the issue of adequacy. The generosity of benefits will depend upon the benchmark policy makers use as a minimally acceptable standard, but also on the overall budget available. Second, there is the issue of fairness, in particular the idea that the tax system should treat individuals in similar situations in a similar way, what economists refer to this as “horizontal” equity (as opposed to “vertical” equity, which refers to the less well off receiving more benefits and paying less taxes). Finally, there is the issue of incentives and administrative burden. The program should not induce changes in behaviour that unduly add to costs, and distort efficient market outcomes. This involves setting appropriate rates for clawing back benefits as income from work effort increases, as well as keeping administrative rules to target payments and deliver the program from becoming overly burdensome. It may be that the US system is less generous in order to avoid creating horizontal inequities. The inability to perfectly target the population of low-income families through the tax system, and the extra administrative costs associated with trying to do so, limit overall adequacy. But the reason for the high level of tax filing among low-income Canadians is in part because benefits are provided this way. In particular tax filing jumped in the early 1990s because refundable tax credits associated with Canada’s value-added tax, which was introduced at that time, were administered through the tax system. Tax-filing is likely to be a behaviour that will change in response to program generosity supported by an appropriate communication strategy. Another reason for lower generosity may be a worry over other kinds of incentives. Will families reduce work effort and market income in order to become eligible for the program? Is the American birth rate more likely to go up because of the possibility to collect a few thousand dollars from the government? Or perhaps the less generous level of support in the United States reflects a different perception of social priorities, and any possible negative consequences from child poverty. If poverty is only temporary, if there is a good deal of mobility and it has no long term consequences for children, then possibly lower levels of support are not of consequence. A somewhat unrelated FYI. An interesting finding that points at the inequity of the US school system. This paper investigates whether international differences in math and science achievement, and specifically the lower US scores, can be explained by family socioeconomic status (SES) and differences in school factors. Using 2009 and 2006 PISA data for the ten largest developed OECD countries, the results show that, while family SES has a strong effect on students’ achievement, it does not explain the US achievement gap with other large developed OECD countries. In contrast, a substantial number of school variables not only have significant effects on math and science achievement, but they contribute more to the US gap than SES differences. Thanks Ron, this looks very interesting.